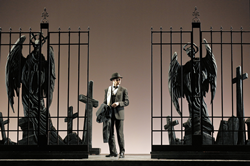 Palm Beach Opera presents Mozart’s iconic opera “Don Giovanni” through the modern lens of film noir in a stylistic production at Kravis Center for the Performing Arts for one weekend only, Feb. 22-24. The second opera of the company’s 2018-2019 season, “Don Giovanni” tells the story of a young, arrogant womanizer who finds himself at odds with the vengeful women from his past. A rare opportunity to experience Mozart’s score against the backdrop of film noir, this production features stylish black-and-white sets, sophisticated costumes, and dramatic lighting design, all reminiscent of the 1940s film genre. Director Kristine McIntyre, who has directed more than 80 operas across the country, designed the reimagined production. McIntyre will make her Palm Beach Opera debut in this performance. Baritones Andrei Bondarenko and Edward Nelson (Feb. 23) will both mark their Palm Beach Opera debuts in the shared starring role of Don Giovanni. Bondarenko will also make his role debut in this performance. Last seen at Palm Beach Opera as the Countess in “Le Nozze di Figaro,” Caitlin Lynch will perform as Donna Anna. Also singing as Donna Anna is Hailey Clark (Feb. 23), praised for her "warm" and "effortless" soprano by Opera News, who will make her Palm Beach Opera debut. Soprano Danielle Pastin, who made her Palm Beach Opera debut in the company’s world premiere of “Enemies, A Love Story” in 2015, returns to sing Donna Elvira. Also performing as Donna Elvira is Felicia Moore (Feb. 23) in another house debut. Don Ottavio will be shared by tenors Bogdan Volkov, 2016 second-prize winner at Plácido Domingo's Operalia, and David Margulis (Feb. 23) in two debut performances. Former Benenson Young Artist Danielle MacMillan, last seen at Palm Beach Opera as Cherubino in “Le Nozze di Figaro,” will perform as Zerlina. Masetto will be played by South Florida native Neil Nelson, who headlined Palm Beach Opera’s Summer Opera Nights series last year. Bass Mikhail Kolelishvili will perform as Commendatore in his Palm Beach Opera debut. Marcus Dilliard will design the film noir-styled lighting, marked by dark shadows and characteristic neon lights, in another house debut. Palm Beach Opera’s Chief Conductor David Stern will lead the orchestra. “Don Giovanni” will be sung in Italian with English supertitles above the stage. Performances begin at 7:30 p.m. on Feb. 22 and 23, and at 2 p.m. on Feb. 24. Tickets start at $20 and are available for purchase at pbopera.org or by calling the box office at 561-833-7888. Palm Beach Opera will close the mainstage season with “Die Fledermaus” in March.